Beach Hawaiian Theme Lanai Patio Décor. 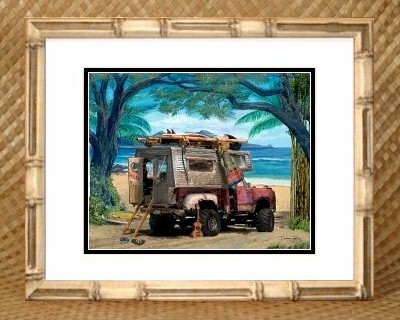 Cruiser Art Hawaii Hawaiian decor patio lanai beach theme. Decorate with vintage Hawaiian surf surfing theme. Hawaii Hawaiian decor patio lanai beach theme. Outdoor decor design surf surfing beach theme decoration. 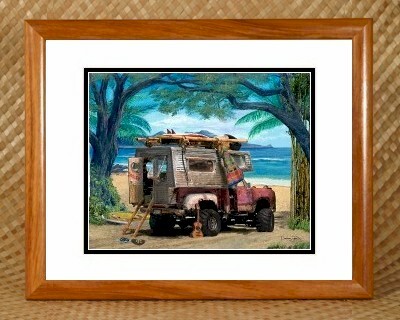 Homemade Dodge camper framed art print poster picture painting. We offer two attractive frame choices - Hawaiian Koa veneer (above) and Tropical Bamboo (left). Frames are available in two sizes. The smaller frame features an 11x14 inch matted version of our Dodge Camper open edition laser art print. The larger frame features a 16x20 inch matted version of the Dodge Camper, which has the added attraction of being printed on Linen Weave textured paper (details below). The outer mat is white while the inner mat forms a black border accenting the print's vibrant colors. You may select a custom inner mat color at no additional cost. The link to the left shows the color options.